Influx of warm Atlantic waters from the Norwegian Sea and warm winds from the south to the Kara and Barents Sea have forced the ice edge northward. Arctic sea ice reached its annual maximum extent last week and is now the lowest winter maximum in satellite record, according to the scientists with the National Snow & Ice Data Center. 14,52 million square kilometres. That was the extent before this season’s ice started to shrink again after March 24th. The Arctic has never before in modern times seen less sea ice. The maximum extent is 1,12 million square kilometres below the 1981 to 2010 average and 13,000 square kilometres below last year’s record low. Little sea ice is likely a direct result of a crazy warm winter in the Arctic. As previously reported by the Barents Observer, temperatures in the Barents- and Kara Seas have been above average everywhere in the Arctic, with special hotspots at the North Pole and in the Svalbard area. According to the National Snow & Ice Data Center these high temperatures condintued into March, with air temperatures during the first two weeks reaching 6 degrees Celsius above average in a region stretching across the North Pole toward northern Greenland. 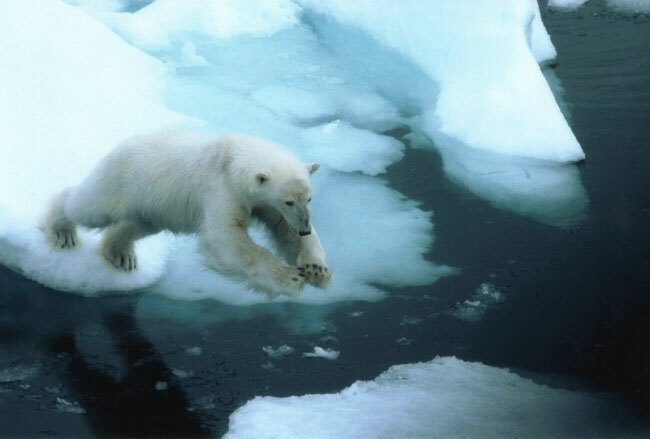 On Svalbard, the temperatures have been even crazier, up to 12 degrees Celsius above average north of the archipelago. The scientists at the National Snow & Data Centre in Colorado fear the situation will be even worse with an accelerating process difficult to reverse. “If surface melting starts earlier than average, the snow darkens and exposes the ice below earlier, which in turn increases the solar hear input, allowing more ice to melt,” the analyse reads. The question is: Has the Arctic melt passed the point of no return?